Progressive slots slots are slot games that offer a progressive jackpot - the highest payout which grows with every game that is played. Progressive jackpots in the slots are one of the main targets and dreams of any casino player. The jackpots are tracked both online and in land casinos and let you see the total prize you are trying to win at the moment. 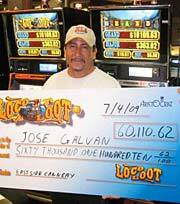 Progressive jackpot grows by a small amount from every bet played at the slot machine. This means that from every coin you put into a progressive machine, a part of it is kept by the casino, a part is given out as payouts and the smallest percentage is added to the progressive jackpot. This continues until somebody hits the winning combination and wins the jackpot. The players can track the growth of the jackpot in a special window at the front of the slot machine. The odds of winning the progressive jackpots are not very big, however, if you don't play, you have no chances at all. At any casino you visit you can see the list of recent winners who have won the jackpot at each slot game. If you look for progressive slots there are many options at online casinos. In addition to the regular progressives the players can try their luck at games with the random jackpots. A random progressive jackpot is much like a traditional one, however its starting amount is chosen randomly every time you load an online slot game. The random jackpot also grows whilst you are playing and can reach huge sums. NB! Most of the time, in order to claim for the jackpot you should be playing the max number of coins. Therefore, the main strategy for any progressive slots is to Bet Max in order to win the biggest money prize. Not all progressive games are the same, sometimes there are different types of jackpots. Let's take a look at the two basic types of progressive slot machines. Linked progressive slots are groups of slot machines that are electronically connected to make a common jackpot that can sometimes grow to huge amounts. Every slot machine from this group contributes to the total jackpot that can be hit at any machine. There are also so-called multi-location progressives that are situated in different casinos but are linked to provide a common progressive jackpot. Multi-Location Progressives are progressive slot machines located at many casinos. There can be a hundred or even more of them connected to form one huge jackpot. The first person to win the jackpot blocks it for the others. These are slot machines that provide a separate stand-alone jackpot. This jackpot is for single machine only and has no contributions from any other machines. The sum of the jackpot at an individual slot machine is usually not very large compared to the most widespread linked slot machines. After being hit the individual progressive jackpot drops to very small amount. When choosing a machine to play, you should consider two factors, the amount of money you have and the jackpot offered. If there is a very big jackpot, you should go for it no matter what chance you have. Who knows, maybe you'll be the one who wins it. 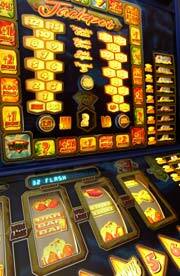 In addition, before you play study the slot machine strategies and don't forget to consider them during the game. If you wish to try online slots with progressive jackpots use our jackpot tracker that has regularly updated information about the size of slot jackpots. When playing progressive slots you can use any strategy you prefer. Still we offer you to learn some of the basic tips that will help you to feel confident playing slot games with progressive jackpot. After you choose a progressive slot machine, learn the rules of this game in order to know the conditions of being paid the jackpot. If you have a chance to choose amongst several progressives, look for the one with the highest jackpot amount that hasn't been hit for a long time. 3-reel slots are considered to have the highest odds of hitting the biggest prize and that is why you shouldn't turn down the chance to play a classic slot game with a progressive jackpot. If you hit a jackpot, set aside a part of the profit if you want to continue playing. All slot strategies state that it is better to pocket the winning or only play with small part of it. Don't believe that playing with just one coin at progressive slots will bring you more money. At most slot machines to qualify for the progressive jackpot the player must bet the maximum number of coins.